Listing likely to be a hoax or scam. One of Razer's Project Valerie laptops has resurfaced on a Chinese shopping website, two weeks after going missing from the company's booth at CES 2017 in Las Vegas. The prototype device appeared on a listing on Taobao over the weekend with an asking price of 150,000 yuan (£18,000, $22,000). Two of Razer's experimental triple-display laptops were stolen in plain sight during the final day of CES, the three-day consumer electronics trade show that takes place each year at the Las Vegas Convention Centre. Amazingly, no CCTV cameras appear to have caught the thieves in the act. The Project Valerie concept, which as yet had not been lined up for commercial release by Razer, is a gaming-orientated laptop that features three 4K resolution display screens that can be folded out to offer a 180-degree field of view. 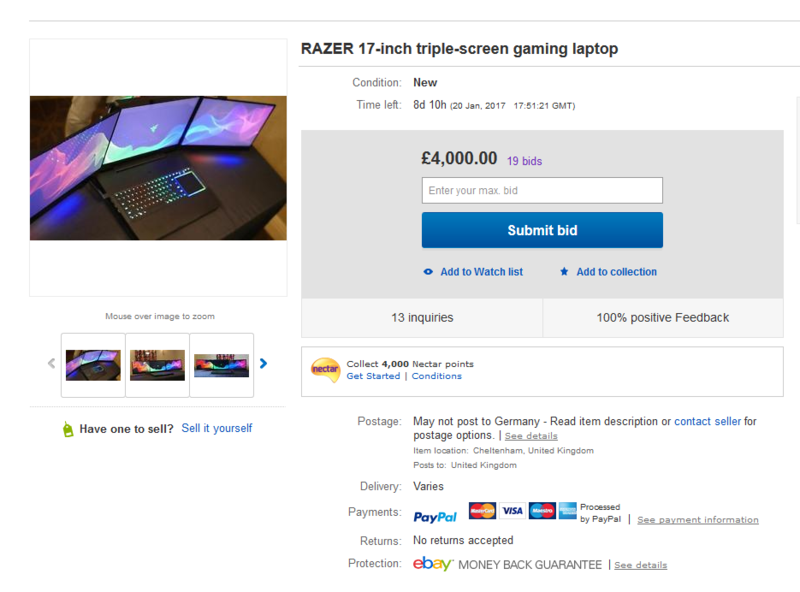 While its online reappearance might seem like a new lead for the beleaguered Razer, it is more likely a hoax or scam. The laptop appeared on eBay UK in mid-January with an asking price of £4,000 before being pulled by administrators. Similarly, the Inquirer has reported that the Taobao listing has also since been pulled, casting doubt on its authenticity. Razer has offered a reward of $25,000 for any information that may lead to the identification, arrest and conviction of those responsible for the theft, with company CEO Min-Liang Tan warning that punishment would be "grievous". The company is investigating corporate espionage as one potential line of inquiry. IBTimes UK has reached out to Razer for comment on the Taobao listings. In 2011, two prototypes of the Razer Blade gaming laptop were stolen from the company's R&D lab in San Francisco.